This morning I am writing a letter to my four daughters. I did not attend a march over the weekend. I could have, and I did make four pink hats for women who traveled to Washington--I am so grateful they went. There were people I knew who I could have met in my own community, could have even driven with. I talked to my girls about going. My older two are away at school-- one's in Italy, and one had a full day of sorority rush--so they got a pass. The younger two had full slates of activities. Instead of attending, I stayed home and made soups. Four big pots of them. And I brought them to people I knew would appreciate them. While I like the decision I made, I am still compelled to write this letter. We didn't attend on Saturday, but that doesn't mean there aren't more roles for us to take on as this new America gets rolling. You've grown up in a community with clean water, good schools, and respect for diverse cultures. You've grown up in a family with excellent health care and enough money for not only basic necessities, but also a lot of extra amenities, too. We have never had to think of those commodities as rights, but they are absolutely rights. And I've always taught you that with rights and privileges come responsibilities. Embrace your beliefs and be proud of them. Take time to wonder about the people who think you should keep your beliefs quiet and private. You shouldn't. Pay attention to social media and the suggestions/invitations to get involved. Take on some of those tasks, and accept some of those invitations. Give money when you can to groups that work for rights. Throughout your lives, I have taught you about practicing kindness whenever and wherever you can. While we can work hard to impact the governing institutions of our country, we always have the power to touch the lives at our fingertips. Know that ripples of kindness spread. Be the pebble that drops into the puddle or into the lake or even into the ocean and creates spreading circles all around it. Know the power of that pebble. While I want you to feel beautiful, I have worked hard at having the importance of beauty come behind kindness, smartness, and working hard. You are all kind, smart, and yes--beautiful-- hard workers. Use your knowledge and your gifts now more than ever. It's easy to feel powerless right now. Do not. We are not. But we lose our power if we remain unaware, uninvolved, compliant, or quiet. 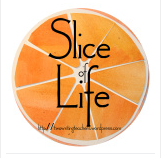 If you are an educator, you probably cannot encourage political activism, but you can promote kindness and you can teach about living with eyes wide open to the avenues and obstacles people face in our world, in our country, and in our communities. For the last few days I have been knitting pink hats. Some of my friends are heading to Washington this weekend, and one of them sent me a link to the Pussyhat Project. Since I can't go to Washington, I have busied myself making pink hats as quickly as I can--they need four! Until the hats leave the house, there are a lot of people who are willing to try them on for me. 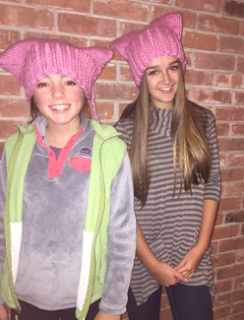 Here are two of my daughters proudly donning pussyhats! What has occurred to me as I knit is how many similarities exist between the processes of knitting and writing. I haven't knit in a long time--years, actually. My first hat was a little rough. My fingers hurt, and the rows weren't as straight as I wanted them to be. By the second hat, I was back in the flow and able to knit without looking, hardly missing a stitch and having to go back and redo it. Writing is also easier the more I do it. When I am in a writing state of mind, my words flow, and I can get words down on paper or on the computer quickly, saying what I mean to without a whole lot of revision. When you knit, every stitch matters, just as when you write, every word matters. This concept is more apparent in a knitting project; anyone who has ever knit anything knows that if you drop a stitch and ignore it, your piece ends up with a growing hole. Every single stitch relies on others to maintain the wholeness of the piece. I love thinking about writing this way--every chapter, every scene, every word matters in a really good writing piece. In a couple of days, my hats will be on their way to keep some of my favorite marchers warm, and I don't know that I will make any more pussyhats. I will, however, return to knitting, as I found a lot of peace and satisfaction having something to do during car rides, football games, and movies I can't bear to miss. I'm searching for good that can come out of the election. There's not much I've found, but maybe I'll make a sweater I love.